This is a perfect example of a verse which contains all the attributes that should be the hallmark of a believer. Who can put these words into practice more than a true Muslim? If one is equipped with these three characteristics, of which Allah the Exalted has spoken of, a revolution can be brought about in that individual’s life. It can not only bring about a revolution in one’s own life, but such a person can also bring about a revolution amongst others. These three things are: calling towards Allah, performing righteous deeds and, having demonstrated obedience, announcing, “I am one who acts upon or endeavours to the best of my abilities to act upon, all the instructions of Allah the Exalted and His Prophetsa.”These things are such that the first of them leads a believer to acquire religious knowledge and then to teach it to the world. It teaches the believer to tell the world as to what the rights of Allah the Exalted are and how they ought to fulfil them. It informs the believer to convey to others as to what mutual rights among the people have been established by Allah the Exalted and how they ought to fulfil them. One can only be driven to tell others if one harbours an anguish in one’s heart for others and is fully focused on freeing them from the grasp and clutches of Satan. At the same time, he is anxious about increasing the number of servants of the Gracious God. One who inculcates this characteristic or has a passion and desire for bringing [people] closer to Allah the Exalted – especially given the current times in which the ploys of Satan and various means of entertainment have reached their pinnacle – and harbours the fear of God the Exalted and seeks His nearness, can undertake such endeavours and strive under such circumstances. The second characteristic is that God enjoins us to perform righteous deeds; in other words, to heed our attention to fulfilling the rights of Allah the Exalted and His servants, and in addition to this, one ought to set such an example that it serves as a model for others. Otherwise, your religious knowledge will prove futile and, if you do not personally act upon these things, your calling towards Allah the Exalted would also be void of the blessings of God and will be fruitless. If this is the case, then all endeavours of calling [people] towards Allah will be in vain and the pleasure of Allah will not be achieved. This obedience also includes the obedience to the Nizam-e-Jamaat as well as to the Khalifa of the time. If one was to say that due to being extremely busy in preaching or being very knowledgeable, they do not require to follow the system, then this is a practice not liked by Allah the Exalted. It was the wish of God Almighty to establish a community in this day and age, and hence He did so. Thus, it is necessary to be attached to this community. Allah the Exalted has proclaimed that even though calling [others] towards Allah is a good deed, yet it is also necessary to proclaim “Innani Minal-Muslimin”, in other words, “I proclaim to practice the highest degree of obedience”. Similarly, the standards of one’s good deeds and righteousness can improve when the standard of their obedience is raised. At times, there are certain individuals who outwardly appear to be pious and serving their faith, however, their end seems not to be prosperous. Thus, Allah the Exalted says that a believer, as well as someone who utters most excellent words will only achieve the highest standards of morals, and [their actions] will only be fruitful when they proclaim that they are submissive, and that they show absolute obedience to the system formed by Allah the Exalted. Furthermore, for us Ahmadis, these standards of absolute obedience will only be achieved, and our tabligh [preaching the true message of Islam] will only be successful, and our virtues will be deemed as virtuous deeds when we demonstrate complete obedience to the Khilafat established after the Promised Messiahas and when we cooperate with the system that is under the supervision of Khilafat. Our individual, as well as collective, efforts will only be blessed when every member of the Jamaat, including every office bearer, worker and missionary understands the system, and also fulfils each other’s rights. Therefore, the seed that God Almighty wishes to sow in every corner of the world through the Promised Messiahas is the law that was revealed to the Holy Prophetsa, and its absolute propagation was decreed to take place in the time of the Promised Messiahas. Hence, just as the Promised Messiahas has said that the seed of righteousness that God Almighty desires to spread in the world is sown at the hands of His messengers, this seed of absolute propagation of Islam was sown at the hands of the Promised Messiahas. In fact the harvest of this seed in certain areas was shown to the Promised Messiahas. Furthermore, the fruits of this seed planted by the Promised Messiahas are spreading all over the world through the institution of Khilafat. So this seed that God Almighty sowed at the hands of the Promised Messiahas is flourishing and also spreading in other countries. As agriculturalists will know how a plant nursery is arranged – it is a custom here too to have plant nurseries – and that these plants can be taken to other places. Similarly, the nursery of the Promised Messiah’sas knowledge and insight of the Holy Quran, and the manner in which he clearly explained to us the message of Islam in light of the Holy Quran, is being replanted to every corner of the globe. The world is being attracted to this beautiful teaching of Islam. “I shall cause thy message to reach the corners of the earth.” (Urdu Tadhkirah, p.260, fourth edition). Therefore, there is absolutely no doubt that the Promised Messiah’sas message shall reach the entire world, and the world will come to know of him as the true champion and the ardent devotee of the Holy Prophetsa, and is doing so. We now see that through MTA, God Almighty is Himself conveying this message to the world. I have previously mentioned on many occasions that with our worldly resources, it was never possible or at least until now it was not possible for us to run a 24-hour-a-day TV channel. It was not possible for such a channel to present programmes in different languages of the world, and for these programmes to reach every part of the world, and also for the translations of my sermons to reach every part of the earth. Six or seven translations are running simultaneously with my live sermons. This is all a result of those promises made by God Almighty to the Promised Messiahas. Then through my sermons and the different programmes on MTA, pious-natured people are entering into the fold of Ahmadiyyat. Many people write to me on how different programmes of MTA – my sermons or other programmes – had a profound impact on them; how they became interested in Ahmadiyyat and later God Almighty enabled them to accept it also. Two or three days ago, a programme from Guadalupe was being broadcast [on MTA] in which there was a new-convert and a missionary. The new convert from there says that he was introduced to Ahmadiyyat but did not take the oath of allegiance. However, when he listened to my sermons, he felt content to take the Bai’at. So these are the works and promises of God Almighty which shall continue to be fulfilled, Insha-Allah [God-willing]. This is not down to any human effort, rather God Almighty has stated that the best quality of a believer is that they call others to God. Hence, God Almighty desires for us to partake in this work which He is actually doing Himself and has already decided to do. He wishes for us to partake of the blessings. Therefore, each and every Ahmadi must give importance to this; that they ought to be part of the task which Allah the Almighty has taken upon Himself; to partake of its blessings and to be among those who attain His pleasure. Therefore, all of you who live here in Spain ought to take time out and dedicate at least two days of the month to tabligh [preaching the message of Islam]. Find different ways of spreading the message to the people here according to their temperament. There is a Spanish Ahmadi convert who came to meet me a few days ago. He mentioned that the Jamaat is not conveying the message of Islam in this country the way it ought to be. In fact, he believes that even the missionaries, except one or two – despite understanding the nature of the people here – are not propagating the message adequately, or they do not know how to do so. He said that although Spain is part of Europe, but the attitude of the Spanish people is somewhat different to the rest of Europe. Due to the current state of affairs, just as the people of Europe are afraid of Islam and Muslims, the effect is to be also found in Spain. However, as Muslims ruled in certain regions of Spain for a long period of time, the people here have a subconscious sentiment to Muslims that needs to be rekindled. In particular certain areas of Andalusia. 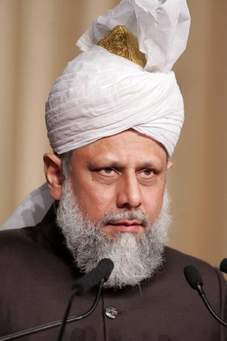 Therefore, where our Central Tabligh Secretary, the Tabligh Secretaries of each Jamaat and other office-bearers ought to be devising plans according to the circumstances, at the same time it is also the duty of every Ahmadi to give time to this, whether they are part of Khuddam, Lajna or Ansar auxiliaries. Here, seven or eight hundred years ago, Muslims were forced to convert to Christianity by the sword. However, we are to win the hearts with love, affection and with the beautiful teachings of Islam. Awareness of the Jamaat and Islam is increasing on a wider scale. TV channels and newspapers are giving coverage to the Jamaat, and this is one means in which we are conveying the message. The editor of a newspaper in Cordoba, or perhaps the proprietor himself came to meet me. He showed me his newspaper and informed me on how he was writing about the community and how he had given an entire page to the Jamaat. During our Peace Symposium in London the representatives of this newspaper and TV channel were also in attendance. The representative of the TV channel also conducted an interview with me in London and then returned here to make a programme about how our Jamaat was conveying the peaceful teachings of Islam. In that program a portion of my interview was also broadcast. So the situation in Spain today is not like that of 35 or 40 years ago. Today, if there is any shortcoming in spreading the message, then it is on our part. Also in different cities there are Moroccans and other Arabs who have settled here. Arab speaking people ought to be utilised to convey the message to them and they ought to be given Arabic literature also. When it comes to distributing Spanish literature based on introducing Islam and Ahmadiyyat, for the last few years I have been sending Shahid graduates from [Jamia] UK and Germany before they enter the field of work to distribute literature in the cities. They distribute literature in all parts of the countries. In my opinion, approximately more than 3 million pieces of literature have been distributed. The general consensus of the new graduates about the people of Spain is that when they distribute literature to people here, they are usually more courteously and respectably greeted. Furthermore, the Spanish people tend to read the literature and there are fewer who throw it away. It has been noticed that by and large the people carefully observe it and take it away with them. Apart from this there is Spanish lady who converted to Ahmadiyyat and lives in London. She is the wife of the Secretary for New Converts in the UK. Her family and parents are here in Spain. She visits different schools, universities and colleges here and conveys the message. She searches for opportunities to come here from London to introduce the Jamaat and spread the message of Islam. So why is it that the residents and missionaries here are unable to find such opportunities? Hence, the Ahmadi residents, office-bearers and missionaries here must make a resolute and concrete plan [for tabligh]. I said the same thing to the newly-converted Spanish gentleman, whom I have already mentioned that he should send me in writing whatever he feels is the best way to do tabligh. When he sends me his suggestions, I shall send it here too and if you are able to understand and implement it then you ought to act accordingly. But the main point is that there should be co-operation amongst yourselves, putting aside all personal egos, we ought to give precedence to that which is beneficial for the Jamaat. We need to understand that by becoming Ahmadis we must fulfil our obligations with a special passion and fervour. The target is not just for new missionaries to come for a month annually to distribute literature. The reason why I began sending them here was to assist you due to the lack of Jamaat members. The second reason was so that a passion and desire to do tabligh may be borne in your hearts, or at the very least the obstacle of not knowing the language properly may be removed, and for everyone to take part in the endeavour of conveying the message. The new graduates who come here do not know the language, yet they still go around and fulfil their duty. Hence, there is a need for us to understand and fulfil the duty to call others to God, assigned to a true believer by Allah Almighty. We must participate in this with great eagerness and enthusiasm. This duty is first and foremost for the missionaries to find different methods in doing tabligh. They ought to inform the members of the Community and to move forward with them. The National Tabligh Secretary expresses his keen desire with regards to doing tabligh. He did not openly say this to me but it seems that there are limitations due to the budget and also with the lack of co-operation from members of the Community. Hence, it is also the duty of the Ameer Jamaat [National President] that if the Secretary Tabligh, missionaries or the members of the Jamaat have an issue with the budget then it ought to be resolved by writing to me. Also the Ameer Jamaat then ought to show full cooperation in this. Much of the expenses is already taken on by the Centre. We are all witnesses to the fact that God Almighty continues to demonstrate this greatness today. A lot of attention of the media and other people has been directed towards this, and it is being expressed openly in some countries. Therefore, this is a testimony to the words of the Promised Messiahas. Just as I stated earlier, that this work is already being carried out by God Almighty, however He wishes for us to take part in this. Hence fully immerse yourself in this. Whilst drawing attention towards tabligh, the Holy Prophetsa gave some advice to Hazrat Alira which also serves as a beautiful piece of advice for us. On one occasion, the Holy Prophetsa said to Hazrat Alira, “I swear by God that if one single person was to attain guidance through you then that would be far better than if you had attained precious red camels.” (Sahih Bukhari, Kitabul-Jihad, Hadith No. 2942) In those days, red camels where considered to be extremely valuable. A person who possessed red camels was considered to be rich and affluent. Thus, the Holy Prophetsa stated that the wealth and fortunes of this world are of no value as compared to carrying out tabligh and becoming the means through which one attains guidance. Therefore, those who have come here should no doubt endeavour to earn worldly wealth but they also ought to devote some of their time towards tabligh. Even though I have said that you ought to give one or two days during the month, you should, in fact, be giving more than this. In this way you will be able to acquire worldly wealth and God Almighty will also be pleased with you. Therefore, this is a commentary of the verse that I recited at the beginning, “Who is better in speech than he who invites men to God Almighty”. The one inviting others [towards God] shall earn the reward. They will also be rewarded when the invitee performs any good deed and then accepts guidance. One who invites men to God shall attain worldly rewards, blessings by way of longevity in age and also the reward for performing the good deed. Thus, in order to become the recipient of God Almighty’s rewards, it is essential to devote time towards tabligh and offering the world guidance. The directives contained in this section Our Teachings, will serve as a guide when we are given opportunities of inviting people towards God and performing good deeds. The teachings contained within it can enable us to become excellent believers. Thus, deeds that are filled with pretentiousness can be of no benefit to man. Those deeds which are not carried out with the fear of God and His pleasure in mind will not be worthy of reward. Even the outcome of those who call others towards the path of God and have similar actions, is not fruitful, irrespective of how much effort they exert. Thus, just as the Promised Messiahas has stated, we need to pay attention towards this also. Whilst mentioning that one ought to perform virtuous deeds constantly, the Promised Messiahas states, “Those people who wish to preserve their faith ought to look to excel in performing virtuous deeds. These are spiritual matters which have a profound effect upon one’s beliefs.” If one wishes to be firm in their faith, then virtuous deeds are a vital component. “Look toward those who choose to live a life of sin and you will arrive at the conclusion that they have no belief in God. For this reason, it is mentioned in a Hadith that when a thief carries out the crime, they are not believers, and when an adulterer commits their crime, they are not believers. The meaning of this is that one’s immoral actions have influenced their pristine belief and rendered it futile. The members of our Jamaat ought to strive to perform virtuous deeds in abundance. If their condition is that of others then what is the distinguishing factor? What would be the purpose of God Almighty’s protection and guardianship? God Almighty will only provide refuge when you please Him through righteousness, purity and true obedience. Remember that He has no special relation with anyone.” God Almighty has no relatives. “Mere boastfulness and vain dialogue can be of no avail.” Idle discourse and making claims are meaningless until one shows loyalty. Thus, actions can only be deemed as virtuous if one shows complete obedience and perform actions with this in mind. Also they are carried out to attain the pleasure of God. When one completely breaks away from personal desires, and their every action has one goal – which is to give precedence to the Will of God and obey all His commands – in such a case this will be labelled as true obedience. It ought not to be the case that when there is personal gain, one demonstrates obedience and when something is averse to one’s own desires, one makes complaints. Always remember that making unnecessary complaints to the administration of the Jamaat inadvertently leads one away from the Jamaat. Then it also leads one away from faith, Khilafat and even God Almighty. We have seen the fate of such people in the past. May Allah the Almighty enable us to propagate the message of the Promised Messiahas and make us a part of his victory. May He enable us to disseminate His message and make us a part of His dominance. Whilst offering taubah, istighfar and also praying, may we fulfil our responsibility of spreading the message. May we fulfil the due rights of God Almighty and His creation. It is the fulfilment of these rights that enables one to carry out virtuous deeds. May we keep the pleasure of God in mind in all of our actions and be counted amongst those that are completely obedient to God Almighty. When we keep these matters in mind, then Insha-Allah [God willing], we will be able to see the victory of Islam in accordance with the promises of God Almighty. May Allah enable us to do so. Yes, let us study these Friday Sermons again and again !